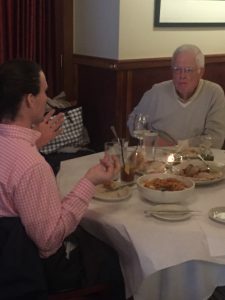 Education students met with alumni at Little Italy’s Francesca’s. Zachary Biddle ’18 — I come from a small town just East of Indianapolis called New Palestine. Being from there, I was not immersed in anything but white culture. To be honest, I came into this week with much skepticism on what it was I would be experiencing. I was skeptical of things like public transportation, being in a school/neighborhood I had never experienced anything like, and how the students would interact with me. I was nervous that the students would treat me with no respect because of what I had heard and seen about public, urban schools in big cities. If I learned anything over the week, it would be to not judge a book by its cover. This week has been one of the most rewarding and eye-opening experiences I have had in my life. The school itself was a great experience. Not only was it n experience for me to learn about these kids’ lives, but also, it was an experience for these big city kids to learn about a kid from rural Indiana. I created a bond with these students over the past four days that I did not expect to happen. Many of these students have no support system at home, so the school is the only support they have. It was great to know that my doubts and skepticism about Chicago Public Schools could be put to rest knowing that there were great students and great teachers apart of it. We have been immersed in different cultures throughout the week by going to Chinatown, Pilsen, and Little Italy. These places have also led to new experiences in culture in the form of food. The food that we have tried this week has been amazing and I have been able to try new things that I never have in the past. For example, I tried Calamari for the first time and loved it. It was interesting to see how different cultures expressed ideas as well. In Pilsen, which is a Mexican neighborhood, we walked around and saw Mexican murals painted on the side of buildings and all over. This showed us how different cultures interact and express feelings and ideas. Thursday night, we got to go to a great restaurant in Little Italy called Francesca’s. We met up with Alumni there and talked about our week and what this trip has meant to us so far. It was cool to see how what we were seeing in the neighborhoods and in the classrooms matched up with what the Alumni think about the ideas. Talking with Alumni and fellow Wabash peers and staff allowed us to debrief how our week as been, and do so in a way that allowed us to look at what others have noticed while being on this trip and think about their perspectives and how it can change the way we all think. All in all this week has been a culture shock for me. It has opened my eyes to new perspectives and allowed me to look at things through a different lens. I am thankful for this trip and am a better person because of it. For future students that go on this trip, go in with an open-mind and be ready to try new things, because at the end of the day, we are all apart of these United States and it is our goal as Americans to be welcoming an accepting to all cultures and walks of life. Education students enjoying a dinner out. Zachary Bleisch ’18 — We have been in Chicago now for three days, and have spent two days teaching in the classroom. I am teaching 5th-8th grade algebra at Walsh Elementary. It’s located in a predominantly Mexican community and this is apparent in the school. My first impression of my school was fantastic! All of the staff was overly excited a welcoming to not me, but also the students when I first walked in the building, and it has continued throughout my time in the classroom. In addition to my warm welcome, my host teacher is a phenomenal example of what an educator should be. She has the students’ trust and has built friendships, but she also is able to manage the classroom and create clear boundaries. It has been amazing to be able to see her interact in front of the classroom and learn from her. While Walsh has been a great school, they have faced some of the stereotypical struggles of Urban schools. Over the past couple weeks, there have been a series of gang related shootings in the neighborhood, one of which happened on the street of the school, in front of the eight grade class. I wouldn’t have been able to tell by the student’s actions if I hadn’t been told. It is nice that the students are able to look past and continue on with their lives, but also being that close to a school shooting did not have a visible impact on many students. This is a pretty extreme instance, and my experience at Walsh has been amazing! Tuesday was teacher appreciation day, and the family of the students brought in lunch for the teachers. As I mentioned earlier, the school is predominantly Mexican, and they brought in some traditional Mexican food. I am a huge Mexican food fan, so this was a great experience. 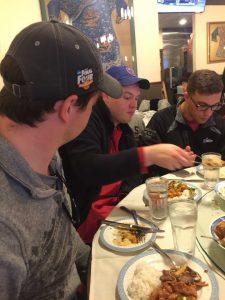 So far we haven’t had a large amount of time to wonder around Chicago, but we have been able to go to Chinatown and walk around the city for a little on Monday. We walked to the lake front on Monday, but unfortunately Navy Pier was closed by 9. 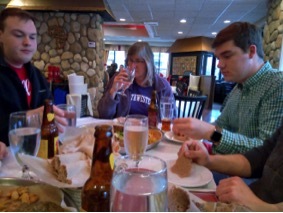 Tuesday night we went to an Ethiopian restaurant. This was the first time I had this type of food. The food was great and much different than anything I have had before. After dinner we went to Wrigley as a group and walked around the area and stores. I had never been to Wrigley before, and it was an amazing place, and I am glad I was able to see the historic park. Overall, the week has been fantastic, I have had many new experiences and I am looking forward to being able to get more involved in the classroom and exploring more of Chicago. Dalton Miller ’17 — On the way to De La Salle high school Sunday afternoon, I tried to observe the areas we travelled through to gain an idea of what student life may be like, and I came face to face with a three story moose blowing a bubble that made me realize a stark truth about Chicago: don’t expect things to be what I consider “normal” in rural Indiana. As I prepared to enter the Catholic, De Lasallian high school on South Side Chicago that I’d be in all this week, I honestly had no idea as to what I should expect as I stepped through the main doors on Monday morning. 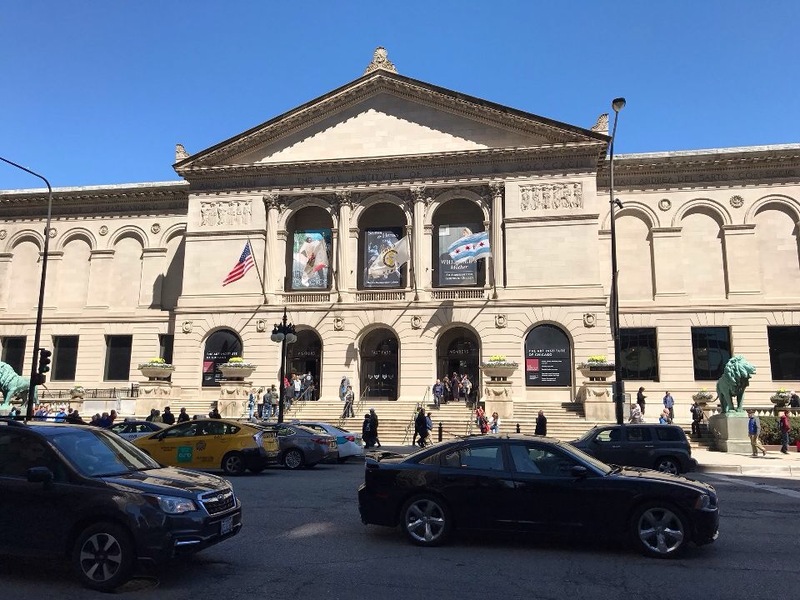 Once my mentor teacher arrived and took me to his classroom on the third floor, I was still rather anxious as to what I would experience in the classroom during my week stay in Chicago. That anxiety quickly retreated and was replaced with excitement as students began to file in and prepare for the day’s class. Before even stepping foot into De La Salle to meet the students and faculty at the school, I had prepared myself for an experience entirely different when in reality it’s not too far from the classroom settings I’ve seen in the past, specifically Wabash. Since I am placed at the De La Salle all-male campus I see a lot of similarities in how the classroom is ran by my mentor teacher, but it’s slightly odd because it is an all-male atmosphere at the high school level instead of the collegiate level. Since it is an all-male school the discussions and lessons have resembled those I have experienced at Wabash, but the content and approach to each topic is slightly shifted as the students are only sophomores in high school. Although this makes the classrooms louder and harder to gain or maintain control over, I can’t help but think if I would be able to take that kind of commanding control when it comes to me teaching urban students. At Wabash we have a healthy variety of rural and urban students–whether it be large or small cities and towns–that adds to the diverse nature that Wabash prides itself on. This is not at all true in Chicago. Kids do come from all over the city, but nothing in Chicago comes close to the town of Crawfordsville that I’ve lived in my entire life. Of course travelling and living in Chicago has been an eye-opening and sometimes drastic change from what I’m used to in Indiana, I’ve thoroughly enjoyed the few days I’ve been here this week. Without travelling on public transportation, walking upwards of 5 miles a day, and observing a Catholic De Lasallian classroom all day I can’t say I truly experienced Chicago in my week here. I have experienced a variety of what Chicago has to offer, but without living, travelling, and observing the many areas of Chicago that this week has given me the opportunity to do I could never say I actually experienced urban education. It may only be Tuesday, but my time in Chicago has already opened my eyes to thousands of new sights and events that occur on a daily basis in an urban setting. I only hope that my remaining days here will provide me with opportunities to experience Chicago in as many ways as possible that help me better understand the basics of urban education. Our immersion trip has already been amazing and I know the rest of this week will provide me with a personal understanding of the fundamental principles needed to be an effective urban educator, wherever I may be in the near and distant future. Students spend time at Chicago’s Chinatown at the Emperor’s Choice Restaurant. Saturday night I set my alarm for six a.m. so that way I would have time to get up and shower before heading to the train station at 6:30. 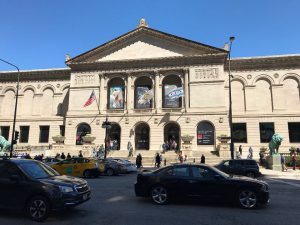 As I went to bed, I had several thoughts about what my trip to Chicago would be like, but I really had no idea what I was going to experience. I am not sure what time I fell asleep, but I know that I woke up well before my six a.m. alarm. I woke up and looked at my phone and it read “5:00 a.m.” I lay there and tried to go back to sleep, but was unable to do so as thoughts of excitement raced through my head. Eventually I just got up and got ready. 6:30 a.m. finally rolled around and my friend kindly drove me to the train station. I got there at the same time that Zach Anderson did and as we stood their waiting for the rest of the group to arrive we discussed our different views of how the week would go. As the rest of the group showed up we shared our views and asked them how they thought the week would go. I think that we all had somewhat of an idea, because we have all had friends that have taken the class before. Just hearing their stories was not enough though. The train arrived, a little late unfortunately, and as we boarded I stated to feel even more excitement knowing that our trip was actually beginning. I was able to stay awake for a little bit of the train ride just because it was my first time experiencing anything like it. After that excitement left me, drowsiness overtook me and I fell asleep. I was in and out of sleep the whole trip but was fully awake as I heard one of the voices come over the intercom to tell us we were ten minutes away. Even more thoughts started to race through my mind as we started to come up on the city. I was able to see the skyscrapers and all that the entire city had to offer and I knew that this was going to be a good start to the week. I was still pretty tired at this point but was able to push through it due to all the curiosity I had about the city. As we walked to our hostel, Dr. Seltzer would tell us about different streets and different places that she knew about. I tried to pay as much attention as possible knowing that I may not be here again for awhile. I wanted to make sure that I was taking everything in. We finally arrived at the hostel and we were able to relax for a little bit, but not too long. After about thirty minutes of just sitting around and relaxing, Dr. Hensey arrived and an orientation while we ate lunch. We ate sandwiches from that café that is located in the hostel. They were rather tasty. Once we were done eating, Dr. Hensey took us through a presentation and helped us learn more about Chicago Public Schools, our own individual schools, and the public transportation system. This was all very helpful because as soon as that was over we were sent to find our own schools by ourselves. Zach Biddle and myself walked out of the doors of our hotel took a left, took one more left, and then walked until we reached the point where the orange line stops at Wabash and Adams. The orange line is the train route that we take to get to our school, Thomas Kelly High School. We scanned our transit cards; obviously it took us a few tries to get right. We sat there and waited a few minutes, but the train finally arrived and we boarded. We were a little nervous about getting to our school, but in total it only took us thirty minutes to get there. Thankfully we did not have any problems at all. Once we got to our school, we found the front door and looked around the area so that we are not surprised in the morning. After that, we headed back to the hostel and finally checked into our room. Once in our room, I tried to relax a little, but it was difficult. I was tired, but I was still filled with eagerness. There were still things that needed to be done. As four o’clock rolled around we all got dressed and ready and took off towards our next destination, Chinatown. I did not know what to expect from Chinatown, but it did not disappoint. As we walked from shop to shop I tried to take in all of the culture that I am so unfamiliar to. We walked into several different shops to look around and see what the different vendors had to offer. There were some pretty amazing stores that we walked in to. There were way to many stores for us to walk into all of them, but I think that we were able to get a good sense of what it’s like in Chinatown on a daily basis, it just wasn’t as busy as it probably would be. After going through the different shops we went to eat at Emperor’s Choice Restaurant. As we sat there and ate I couldn’t help but think how lucky I was to be on this trip. I am thankful that for the opportunities that Wabash College has given to me. We have been given the opportunity to experience something we may never get to experience again while trying to impact the lives of these children at the same time. Hopefully this week is all that I am expecting and more.